In this video lecture, Franceso Nori from the Italian Institute of Technology (IIT) walks us through the progress that’s been made in humanoid robots in recent years. For example, the humanoids at the DARPA Robotics Challenge disaster scenarios will be required to open several doors to access the disaster scene, but because they are not especially fast and have motor control limitations, they won’t be able do it as efficiently as a real-world situation would require. To tackle these limitations, Nori focuses on finding ways to advance the dynamic system of a robot – the forces that interact and make the system move. 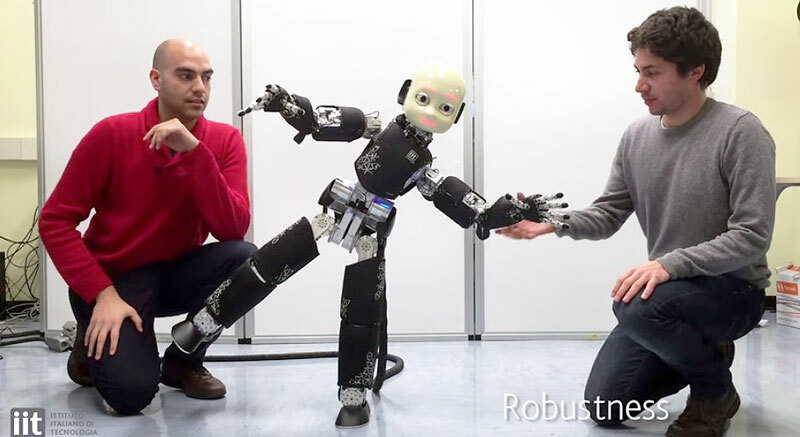 Key to developing dynamic movements in a robot is control, accompanied by the way the robot interacts with the environment. Nori talks us through the latest developments, designs and formulas for floating-base/constrained mechanical systems, whole-body motion control of humanoid systems, whole-body dynamics computation on the iCub humanoid, and finishes with a video on recent implementations of whole-body motion control on the iCub. Francesco Nori received his D.Ing. degree (highest honors) from the University of Padova (Italy), in 2002. He obtained his Ph.D. in Control and Dynamical Systems from the the same university in 2005. In 2007, he joined the Istituto Italiano di Tecnologia (Italian Institute of Technology), contributing significantly to the development of the iCub humanoid robot. His research interests are currently focused on whole-body motion control exploiting multiple (possibly compliant) contacts. With Giorgio Metta and Lorenzo Natale, he is one of the key researchers involved in the iCub development, with specific focus on control and whole-body force regulation. Francesco is currently involved in two FP7-EU projects: CoDyCo as coordinator and Koroibot as principal investigator. In the past he was also an investigator in ITALK, VIACTORS and Robotcub.